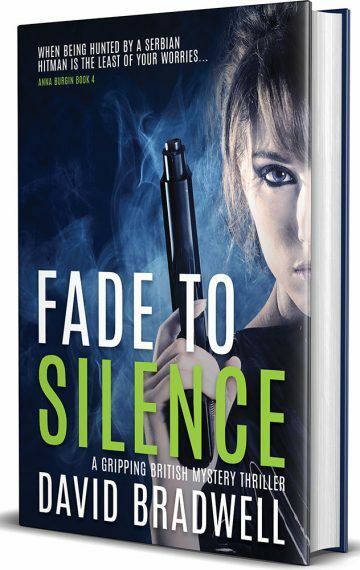 Fade To Silence is here. Order your copy today. Welcome to the home of David Bradwell - author of the Anna Burgin mystery thriller series. I hope you enjoy the site. You can see information on the books below, or scroll down for features and information. You can also follow me on Twitter or via Facebook, and even now Anna on Twitter if you'd like to. Meanwhile, don't forget to visit the blog for the latest updates, or visit the shop to order signed paperbacks. Her voice carried through the open doorway. Inside the office his heart skipped a beat, as it always did at this time of the morning. He didn’t know it would be for the very last time. 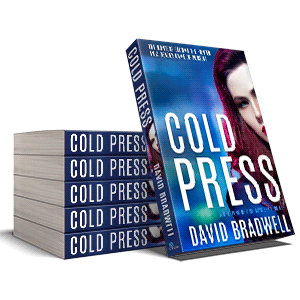 Packed with intrigue, mystery and dark humour, Cold Press is book 1 in the Anna Burgin series, the debut novel by David Bradwell, and an Amazon top 10 bestseller in both crime and mystery genres. He heard the rustle of clothing. Immediately he was wide awake. And then he heard a voice, softly spoken but unmistakeable. A voice he’d never expected to hear again. Book 2 in the Anna Burgin series is a gripping thriller in which the stakes get higher still. 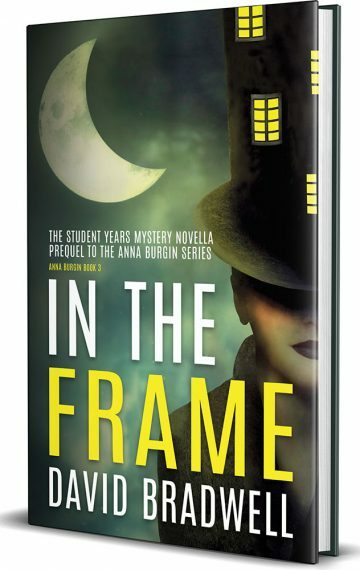 In The Frame is the novella prequel to the Anna Burgin series of mystery thrillers, and introduces Anna and journalist Danny Churchill. Anna is arrested. The evidence is overwhelming. Was it a moment or madness or is there an enemy in her midst? Out in paperback now, or get the ebook FREE when you join the mailing list! Balkan gangsters, corporate spies and a fugitive killer are all on the loose in London. 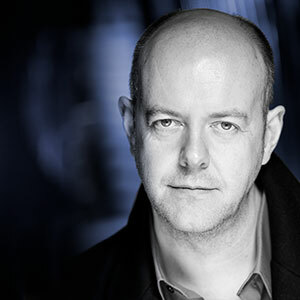 A body is found but DCI Graham March seems suspiciously keen to arrest the victim’s wife. Mayhem ensues in the most complex, dangerous and action-packed investigation so far. 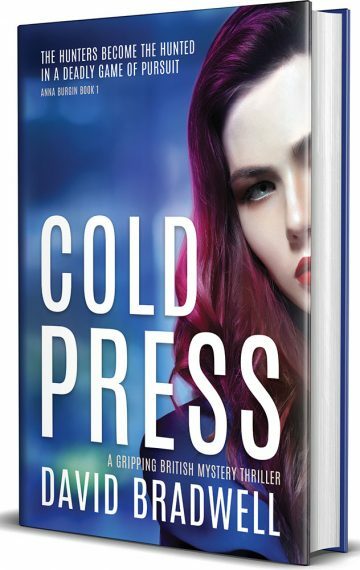 Cold Press and Out Of The Red are part of the Anna Burgin series. But who is Anna? Click the links below to find out more, download samples, or to read an author interview with David Bradwell. Anna is a cheeky and slightly irreverant fashion photographer who lives with Danny, fancies him, but by her own admission is useless at relationships. She likes a glass of wine (ahem) and is your best guide to all the action. Cold Press began life in 1993 and was finally published 24 years later. 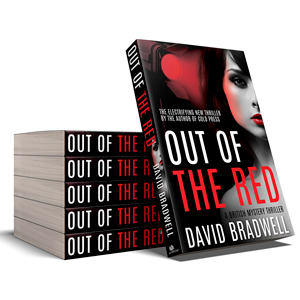 Find out why by reading an interview with its author, David Bradwell. Discover how the original manuscript turned into an Amazon top 10 selling novel. Tempted but not sure if it’s for you? You can now get a taster of the Anna Burgin series by downloading a PDF of the prologue and first 10 chapters of Cold Press. If you haven’t yet read Cold Press you should probably do that first. 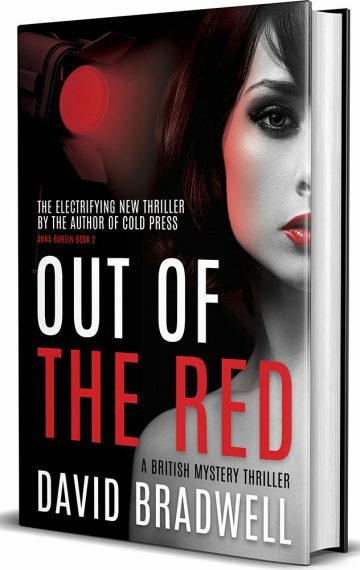 But if you have, you can download a PDF of the prologue and first 10 chapters of Out Of The Red here. via Amazon, Nook, Apple or Kobo. good or bad, or just want to say hello. There are sneak previews of upcoming stories (anyone fancy a trip to Sofia? ), unique opinions, and revelations about the day-to-day life in Camden with a certain someone. And, obviously, lots of cups of tea. Throughout the books there are references to the student years: how Anna and Danny first met and why Anna has given up on relationships. But what really happened? It was quite a story, involving a classic locked door mystery. Everything is revealed in the new novella In The Frame. It’s a completely FREE download, exclusively for members of the mailing list. Join up and download your copy. I’m exceptionally pleased to announce that the shop is now open. You can order signed copies of the paperbacks and get a FREE double-sided Cold Press/Out Of The Red bookmark with every copy! The paperbacks are printed by Clays, St Ives – the same company used by HarperCollins – and they’re lovely. You can order them in bookshops, but signed copies are exclusively here. Explore the shop now. I was amazed and delighted to see Cold Press hit number 1 in its categories on Amazon in the USA and Canada! It was the best birthday present I could have wished for. In the UK it reached number 4 in the mystery list and 9 in crime. Huge thanks to everyone who ordered or downloaded a copy – it really does make all of the long candlelit nights worthwhile. get free books and more. Frame – the series prequel novella ebook.